Maria Sotskova about reasons for change, work with new coach, unusual idea of the programs with continuation and plans for the upcoming season. Maria: I was very nervous on the first day, even afraid of how things will turn out. 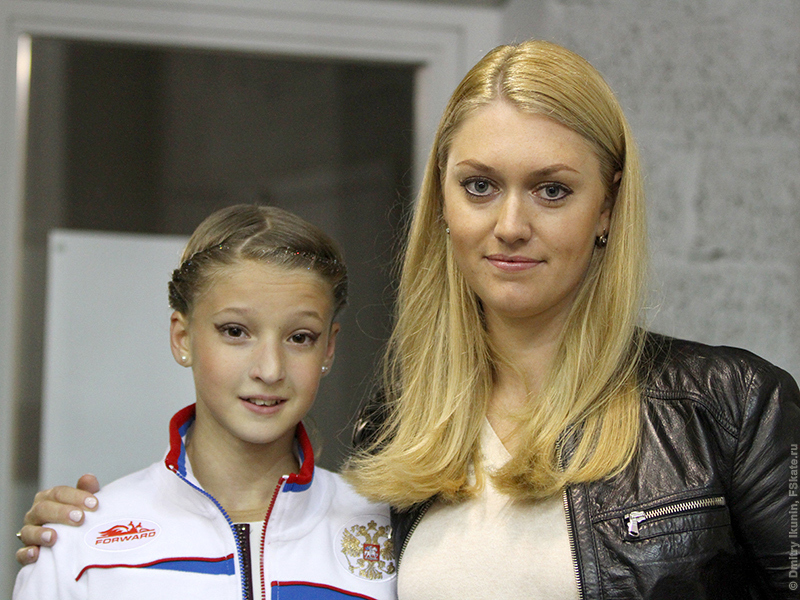 And Elena Germanovna came so serious to the practice. Until that I hadn’t skated for a week, I wasn’t in shape and it was necessary to mobilize immediately, to put yourself together quickly … I managed to do it. And then everything gradually improved, I calmed down, we started to work, work. I feel that I have progress. Every day I work on skating skills with Maxim Zavozin. I feel that I started to skate wider, with more power. Still, the work should be done regularly, every day, and not once in a while. Previously, Maxim came to us on the ice rink in Novokosino not often, and we did a little bit of everything, and here – all at once and a lot. Have you alredy did programs? Who is the author of such idea? Maria: Elena Germanovna. She offered to make free program flying, airy, and short – on contrast. Originally, in the short program was planned other music, but in the work process appeared the idea to unite both program by the music of same composer – Alfred Schnittke. Honestly, I’m very grateful to everyone – coach, choreographers for their help, because it’s a problem for me to find the music and come up with a theme for the new programs. Always someone else tells, finds, offers. I can’t do it myself yet. Previously, the rink was close to you home, now it’s necessary to go from Reutov (town in Moscow region) to train in CSKA. Maria: But what’s wrong with that? Almost the entire country goes to work the same way. I’m not the first, and not the last. It’s ok. The trip takes an hour. Not so scary. I thought it would be worse, harder. My mom and dad also spend an hour on the road. Why did you decide to part with the former coach? Maria: It wasn’t spontaneous, but balanced and informed decision. I can’t say that I took a spur of the moment and left. It was a difficult parting, but I chose a different path. Plus the working conditions in our rink in Novokosino worsened. The amount of ice hasn’t decreased, but increased the amount of people, newcomers added. To skate on ice with 13-14 children – it’s really hard. So I left Svetlana Vladimirovna (Panova) not because it was uncomfortable with the coach. Svetlana Vladimirovna -is an excellent specialist. And I’m grateful to her for all the work and care. I left not because of coach, but because of conditions. After all, no matter how magnificent the coach is, it’s hard to achieve something without appropriate conditions. Did you choose yourself to whom to go? Maria: Yes. I found Elena Germanovna’s phone number and called. Two days spent in suspense, will she take me or not. But in the end everything turned out. So, firstly you explain everything to Svetlana Vladimirovna, and then began to think, what’s next? Maria: Yes, at first I left, and then started to look for a new coach. If I had done otherwise, would have regarded myself as a betrayal. So, I left in nowhere. And will take or not – it’s another question. And If she hadn’t taken you, would you quit figure skating then? Maria: No, I wouldn’t have quitted. My career in the sport only begins. In the new season I’m going to try myself at senior level, so I have everything ahead. Denis Ten – SP/FP in 2012-2013 to “The Artist”, Denis also tried this season to do both programs to “Misa Tango”, but then changed FP to Romeo and Juliet. So, this idea is not overused, and I excited to see what Maria will show us. Because this girl has always stand out with her programs! I hope she won’t loose this unicness in new training group with next choreographers. We had to make new programs for Masha quickly. I wanted to do something special, unusual, like a light breath, fresh stream, because Sotskova’s skating reminds me Carolina Kostner. And it’s true. Petya Chernysheva had everything planned for two months forward, and to squeeze into his schedule seemed almost unreal. But when he brought the music of Schnittke, I immediately said that this is a program for Masha, because I heard in this music what I was looking for, what suits her. We must pay tribute to Peter: in spite of the busyness, he managed to find time to do a free program for Masha. We hadn’t any time left for the short program. So we conneced to work my former pupil Nikita Mikhailov – a talented guy, who has a lot of different ideas, unconventional vision. In parallel, our “sound-director”, a composer of music was looking for suitable options for the short program, and unexpectedly also chose the music of Schnittke, but the other thing. So we got the idea to combine two programs. Both Nikita and Peter did what we wanted, tried to shade and highlight in the programs Maria’s strengths – her grace, ease, beautiful lines, hands … I’m grateful to everyone who has helped and is helping us now in this work. I really hope that we will succeed and we will see a new Masha Sotskova.